One of the simple but yummiest sweet. Always on demand. Warm up the cashews for a minute or so in a hot tava / or in the MW and grind to powder. In a tava, boil water and sugar, bring it to one string consistency. 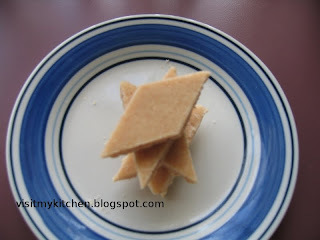 Use a rolling pin / spatula to even out the surface and bring it to the required thickness. Leave it for 5-7 mins, cut into pieces. Thanks my mother in law for this wonderful traditional recipe. The aroma of Besan and ghee filled my kitchen and its tasting awesome. The deep frying before Ladoos and the coarser texture (could have been finer if not for my US Blender) added a great deal of taste for this sweet. 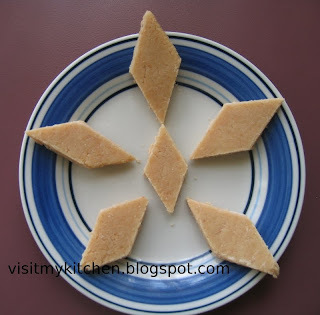 Add water to Besan, sieve well and mix like Roti dough. Divide the dough to portions and roll a small lemon sized dough between the palms to bring a finger like shape (or any shape will do) and deep fry them to a nice red color. Grind the deepfried patties/fingers in mixie/blender to fine powder. 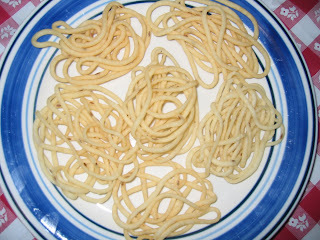 In a pan, mix water and sugar and let it boil till u can see thin threads on consistency test. Remove from heat, add cardamom,add grounded besan powder and give a good mix. 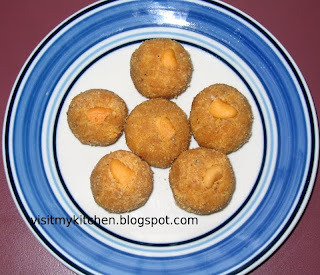 With a touch of ghee, make ladoo while its still warm. Dip one side of Ladoos in ghee and press any nuts to it. Shape wise cannot do more justice as I do not have the Murukku Press, so just made a cone out of plastic wrap and used it. Pressurecook the urad dal wiht 4 cups of water 3 whistles. Once cooled, add butter & hing to it and set aside for an hour. 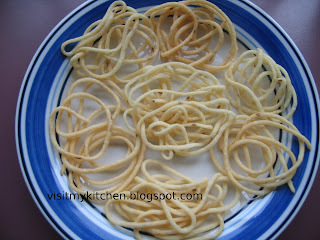 Grind to paste, add salt,cumin/sesame, rice flour & deep fry on oil directly using the Thenkuzhal press. 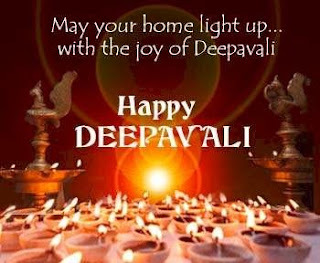 Wish you all a very happy safe and prosperous Deepavali.